It’s time for a trip down nostalgia lane for ‘Cats fans! 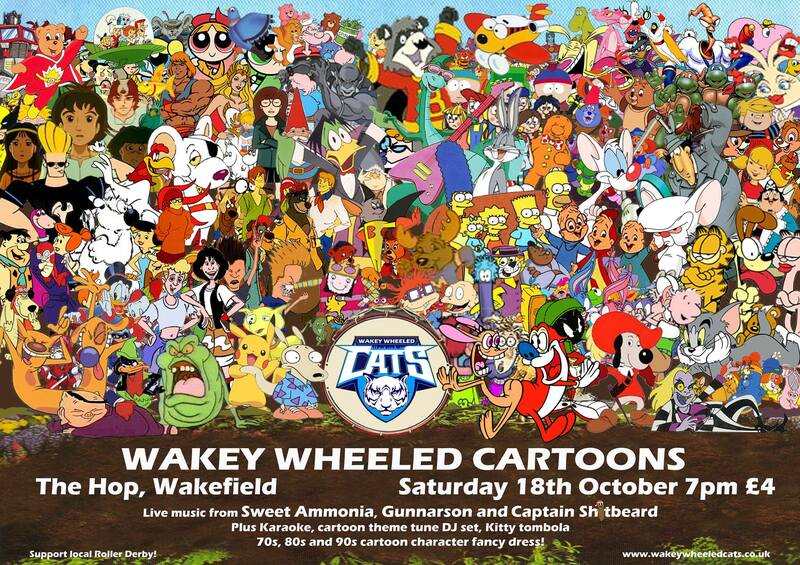 The Wakey Wheeled Cats cordially invite you for an evening of entertainment and hilarity, as we do our best to imitate our favourite childhood heroes. Festivities take place on 18th October at The Hop, Wakefield, from 7pm till late. Expect cartoon fancy dress, kitty tombola, a cartoon quiz, cartoon karaoke (we’ll have no jokes about strangling cats, thank you…) and of course, a chance to get to know the team too. We’ll also have some live music from local bands Sweet Ammonia, Gunnarson and Captain Shitbeard. Tickets are available on the door for a mere £4, with all proceeds going toward the running of Wakey Wheeled Cats Roller Derby League. So for anyone who would like to spend their evening with a fabulous group of roller girls in suitably embarrassing costume, please come along, laugh, sing, and support your favourite kitties. Cats do the Hallam Hellcats Halloween Mixed Scrimmage!